Events | What is the Evidence? 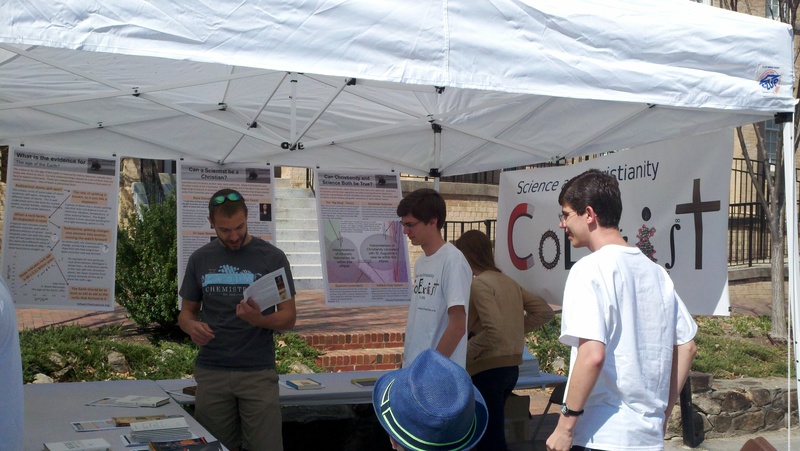 We presented our posters and handed out books and materials at a table-top exhibit at the fifth UNC Science Expo on April 11, 2015 on the campus of UNC Chapel Hill. This was the second busiest of the expos we’ve done. We had lots of good conversations with a visitors from a variety of backgrounds: christians, agnostics, atheists, scientists, seekers. 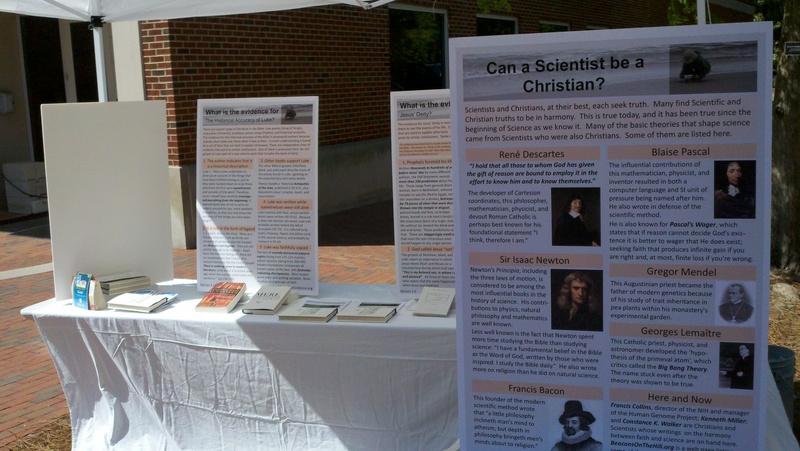 For the first time, we ran out of the handouts for our “Can a Scientist be a Christian?” handouts. 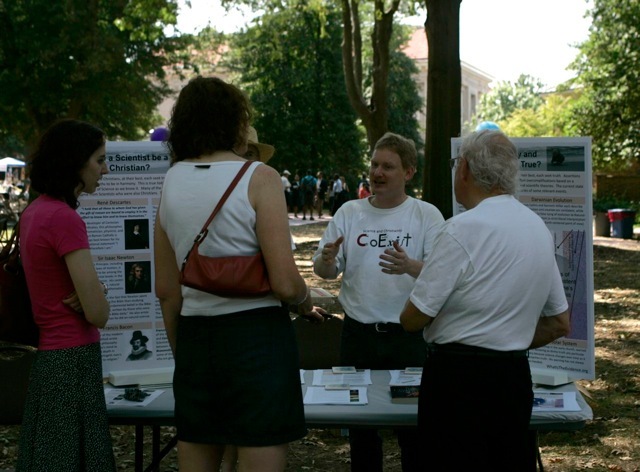 We presented our posters and handed out books and materials at a table-top exhibit at the fourth UNC Science Expo on April 12, 2014 on the campus of UNC Chapel Hill. 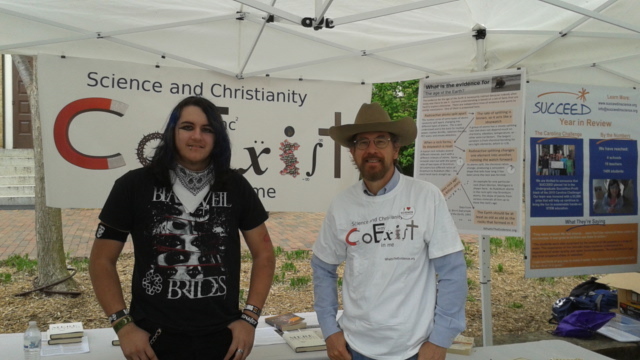 We had lots of good conversations with a visitors from a variety of backgrounds: christians, agnostics, atheists, scientists, seekers (including a couple of very bright teenagers with some probing questions). We presented at the October 28, 2013 meeting of the UNC Student/Faculty Christian Fellowship meeting. We got lots of good discussion afterwards with the attendees. We presented our posters and materials at a table-top exhibit at the third UNC Science Expo on April 13, 2013 on the campus of UNC Chapel Hill. We had a number of people come by the booth and had good conversations with several. We gave away several books and many copies of our printed posters. 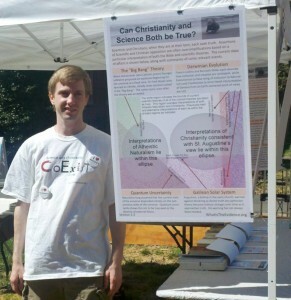 We presented our posters and materials at a table-top exhibit at the second UNC Science Expo on April 14, 2012. We had hundreds of people come by the booth and were able to have meaningful conversations with about a dozen, giving away copies of our handouts, Mere Christianity, and The Heart and Hand of God. We also had scientists at other exhibits wearing our T-shirts. 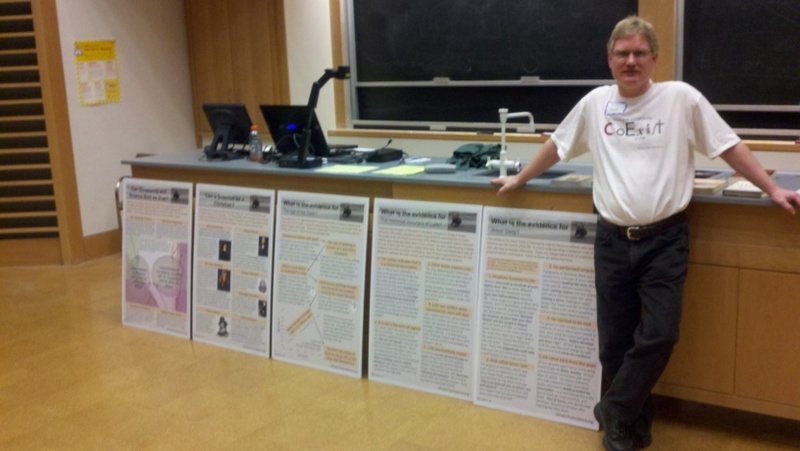 We presented the posters and books and had an open discussion at the UNC Student/Faculty Christian Fellowship meeting on Monday, January 31st on the UNC campus. These materials were developed to be shown at the 2010 Science Expo at the University of North Carolina at Chapel Hill. The event drew thousands of people from all over the state, of which we had the opportunity to interact one-on-one with 100-200.